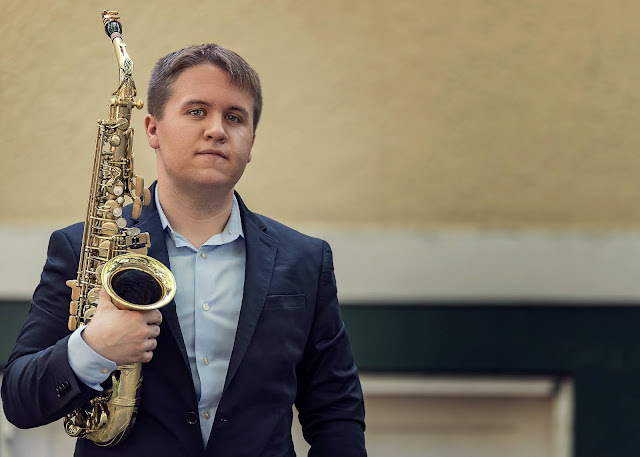 Saxophonist WILSON POFFENBERGER is quickly establishing himself as a soloist, educator, and chamber musician. As a recipient of the 2016-2017 Harriet Hale Woolley award, Mr. Poffenberger is living in Paris, France and studying with Jean-Michel Goury at the Conservatoire de Boulogne-Billancourt. As a soloist, Mr. Poffenberger has performed with the Dana Symphony Orchestra, Youngstown State University Percussion Ensemble, and Hagerstown Municipal Band. He has presented recitals at the International Navy Band Saxophone Symposium (2011, 2012, 2013, 2015, and 2016), North American Saxophone Alliance Biannual Conference (2014), Duquesne Saxophone Day (2014), and the Fondation des Etats-Unis. Recent accomplishments include first prize at the 2014 Dana Young Artist competition, semi-finalist in the 2014 International Saxophone Symposium and Competition, semi-finalist in the 2014 North American Saxophone Alliance Collegiate Solo Competition, and finalist in the 2013 Butler Symphony Orchestra Young Artist Competition. A strong advocate for new music, Mr. Poffenberger has premiered works by Guillermo Lago, Gregory Wanamaker, Robert Lemay, Alex Miller, and Aaron Lockhart. He has maintained a private studio in the Youngstown, Ohio area, providing lessons to students of all levels. Mr. Poffenberger received his Masters of Music degree from Youngstown State University and his Bachelors of Music Education degree from Indiana University of Pennsylvania. He has performed in masterclasses with Otis Murphy, Chien-Kwan Lin, Michael Ibrahim, Timothy McAllister, Vincent David, Claude Delangle, Arno Bornkamp, Masataka Hirano, and Christian Wirth. His primary teachers include James Umble, Keith Young, Kent Engelhardt, and Zach Shemon. Mr. Poffenberger performs exclusively on Selmer Paris saxophones and mouthpieces.